Our family dinners have had a big overhaul. I decided over the recent school holidays that I wanted some variety and some changes in our eating habits. My kitchen also had a big clean out, and I have found joy in cooking our meals again. I was getting tired and bored of the same meals over and over again. The kids were starting to ask why we were having the same meal that we had just five days ago. I must admit I couldn’t be bothered looking for other recipes to use, and it was easier to make a meal that I could just chuck together. Well, things have changed! I have found some wonderful new meals, and I can’t wait to make them. 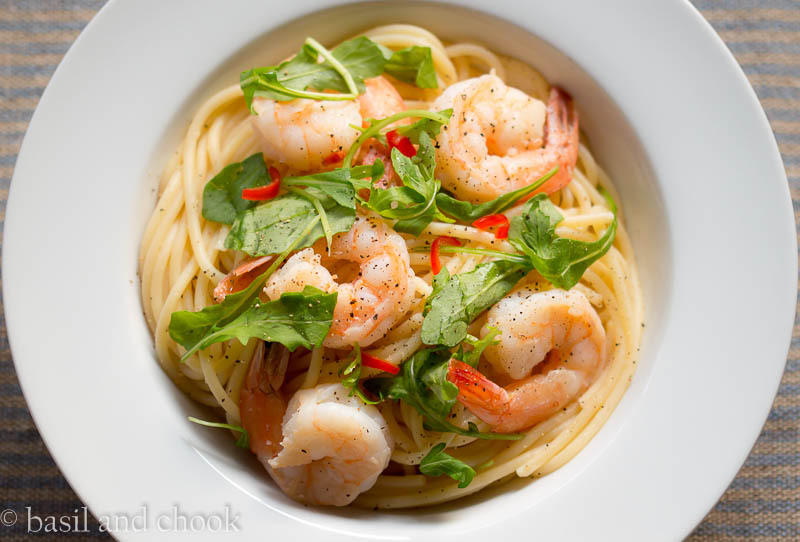 Cook pasta following packet instructions in a large pot of boiling salted water. While the pasta is cooking, heat oil on high in a large frying pan. Gently fry garlic and chilli for 1 minute. Add prawns and cook for 3-4 minutes, stirring or until cooked through. Drain the pasta and return to the frying pan. Season to taste and toss prawn mixture through. Serve into bowls and top with rocket leaves. This meal was a success! Everyone loved it and thought it was delicious. The prawns were perfectly cooked and the sauce was amazingly good. 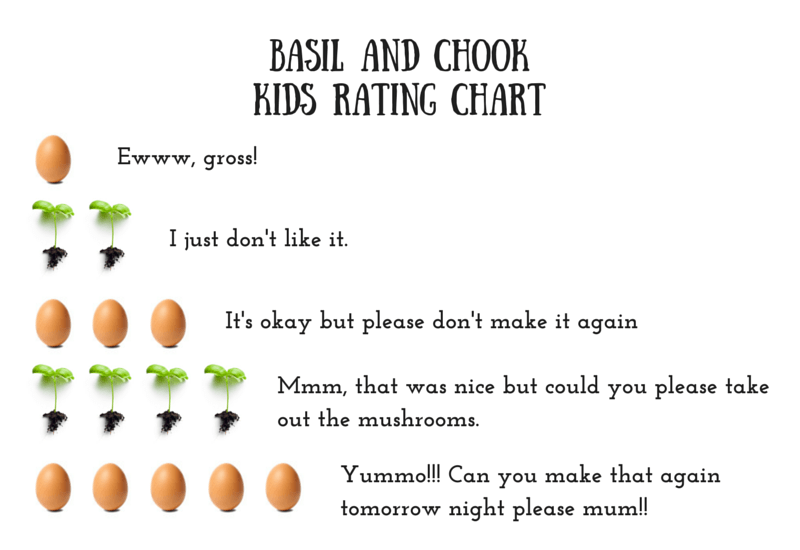 Since I will be sharing all of these new dinner recipes with you, I have put together a kids rating chart. The kids rated this recipe 5 eggs! This will definitely be put on our dinner menu again!!! So simple and so delicious! 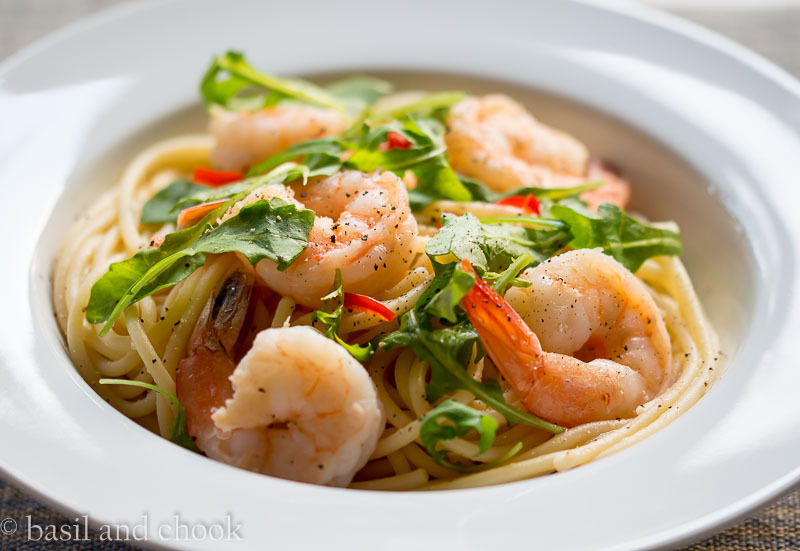 Chilli, garlic and prawns are just a trifecta of YUM! Thank you Lucy. Yes, our meals definitely needed a change. It was time for some variety!! Hi Cathy, your friends meal sounds delicious! Tomatoes, prawns, cream and zafran, oh yum yum!! Hah, I love your rating system. This definitely gets 5 eggs from me.